over the range of 5 to 1500 MHz. 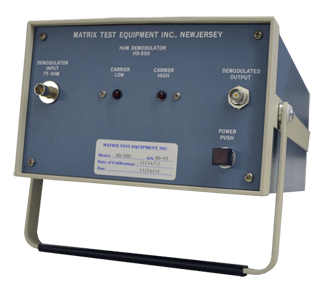 Capable of measuring Hum levels less than -100dBC. ratio of the peak-to-peak hum modulation to the peak of the carrier. over a range of -10 to -50 dBm. or a stand alone cabinet. For more information, view the setup PDF. Internal amplifier provides linear phase response. A 60 Hz square wave is produced with less than 2% tilt. External Equipment Required 1 - A digital storage oscilloscope with signal-averaging capability. 2 - Carrier source with hum modulation levels lower than the levels that are to be measured. Overall Accuracy ±1dB for carrier and modulation levels specified above.